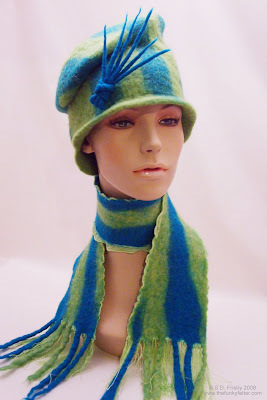 The Funky Felter: Just had to share my latest creations - hand felted wool hat and accessory sets! 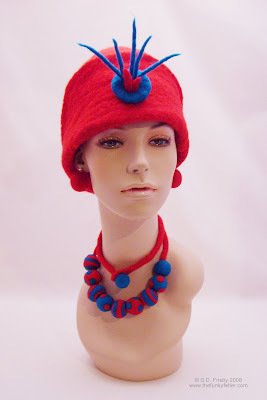 Just had to share my latest creations - hand felted wool hat and accessory sets! Although I've temporarily closed down my Etsy shop for a little staycation - yes, a staycation! This is a term that I borrowed from one of my favorite shows, Corner Gas. Essentially, I'm staying at home, but also taking a little vacation from the stressful things in life. The translation of this is that I'm creating like crazy since that is my ideal vacation anyway. It has been really nice to just have plenty of time to make things, but I'm back to the norm in July. This is when I plan to reopen my Etsy shop and revamp a few things. I'm also getting ready for fall with lots of new designs. I thought that I'd share a couple of them with you today. Not only have I been creating felted goodies, but I also managed to get a home made light box put together with the help of my crafty dad and husband. The mannequin is new too. I call her "Margot" which my husband finds funny, but she looks like a Margot to me. These photos are really test shots in my new light box and mannequin head. I will probably be retaking them once I get the lighting and other things adjusted just right, and I'm not sure if I want to add a wig to the mannequin or not at this point. In a later post, I'll put up a photo of my nifty light box, but for now a couple of pictures of my latest creations being modeled by Margot will have to do. You can see more photos on my flickr account. She really does look like a Margot!!! I love those new hats...and Margot! It's awesome that you have a mannequin to display your new creations!